Wow...it's the last month of the school-year! This year has flown by! This is my last full week of workouts before the craziness that is the 8th grade Washington, DC trip, so I wanted to make it count. This will be relevant later in this post. I accidentally deleted the original picture so here's a grainy screenshot from Instagram. Tuesday 5/9: We had our school's Art and Tech Expo night, which meant we were at work until after 7pm. 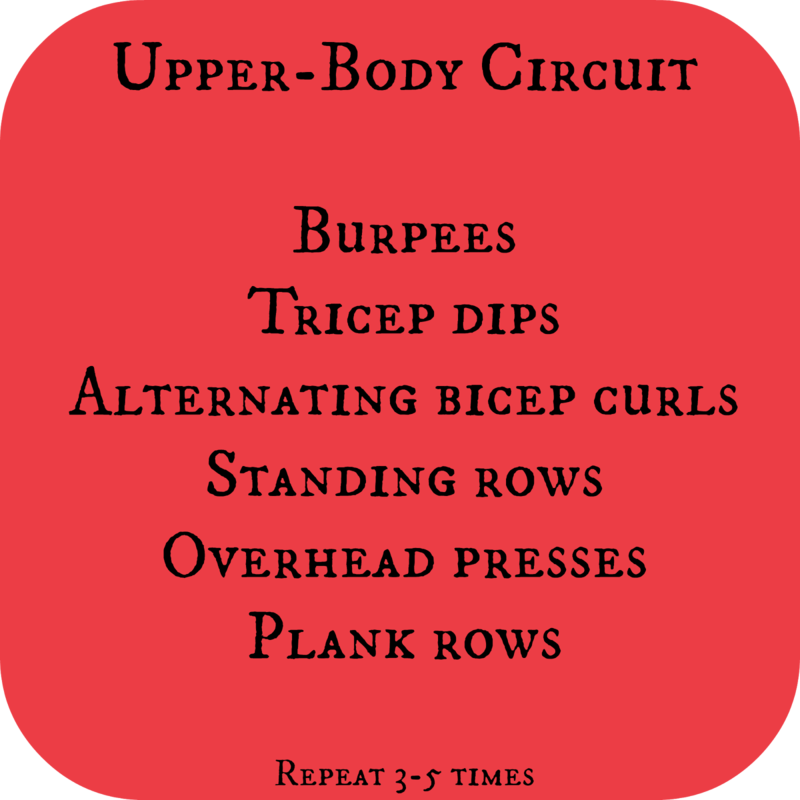 Between 3:30 and 4:30 we fit in a solid circuit focused on upper-body. 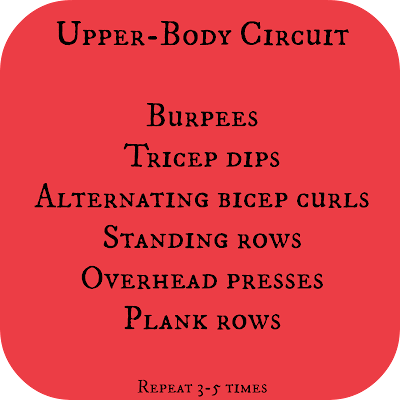 As usual, complete each exercise for 30-60 seconds and rest for 60-120 seconds between sets. My calves were screaming by mile one, but we persevered. It was nice to run with Elizabeth again and she was a good distraction from my pain, but I realized I've really been enjoying the solitude of solo runs lately since all my other workouts throughout the week are done with my buddies. It felt good to be running together again, though. Thursday 5/11: Rest. My body and head just did not feel like working out after my late night Wednesday. Friday 5/12: Two Blogilates videos. One thing I really like about these videos is that Cassey looks strong and fit; she doesn't look underfed or so cut you know she's counting macros and diet-obsessed. I just feel like she's a really body-positive "trainer" to follow. I was in the mood for squats, so we did a pretty easy ab video to warm up and then this plie challenge, which is no joke. I was trembling by the end of it. Saturday: 30 minutes on the max trainer. I was feeling depressed Saturday as I saw friends' 5k posts coming across Facebook and Instagram. I'm just so jealous. I can barely run two miles these days, and a 5k used to be my favorite way to bust out some major speed. This week on our episode of True Life: I'm a Blogger, I experiment with angsty photos to capture my injured-runner-feels. 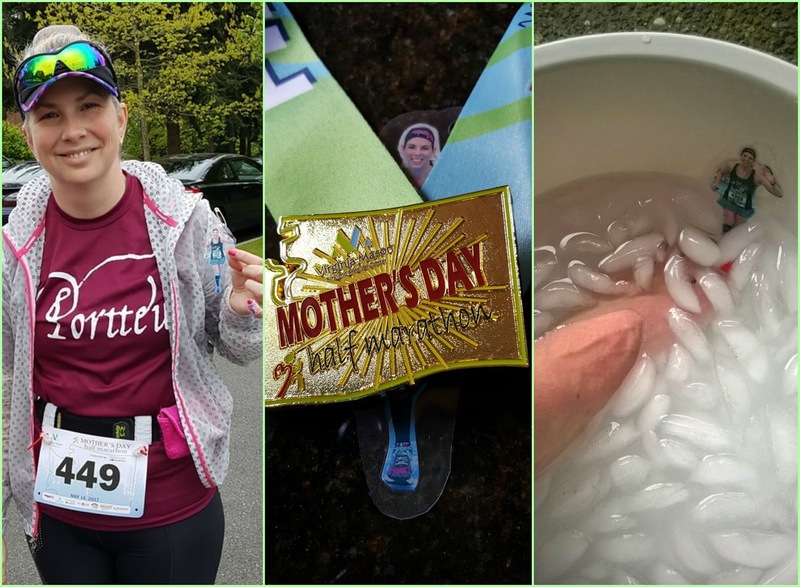 Sunday: My flattie accompanied Christine during her half marathon, but the real me rested, had lunch with Matt and Carole, and spent Mother's Day with my mom. 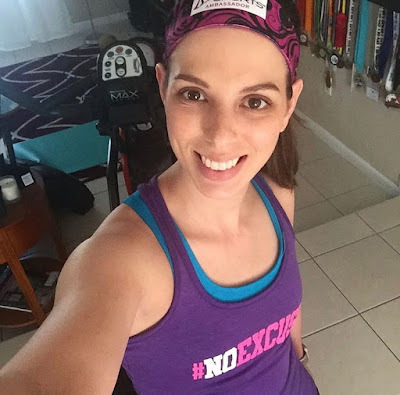 Christine gave me the full half marathon experience. It's a little weird how happy this made me! Thank you so much, Christine! 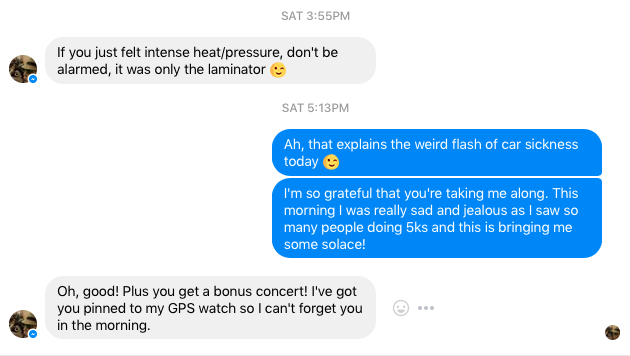 I love my Sub 30 family! Hang in there, girl. One more week and then you can figure out next steps to recovery! You can do it. How do your calves feel now? I'm so sorry they hurt so bad. What makes them feel better? Heat? Ice? I have never heard of a flattie before! I honestly had no idea what you guys were talking about in that first screen shot. What a cute idea! I'm sorry that your calves are hurting so much though. Like Susan said, hopefully it's just a few more days until you have some answers! 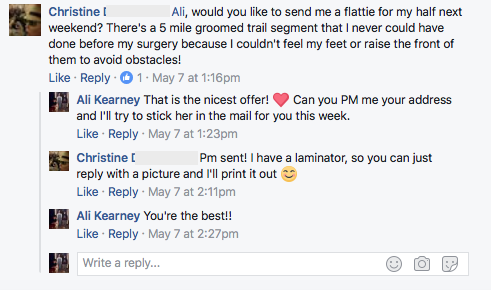 Okay, I think you need to do a post on flatties. I'd never heard of that and it took me a long time looking at the pics before I figured it out! Putting that plié workout on my list to do!